I always like to have a daily treat available in the evening – after a long day it’s good to have something decadent as a nice reward. Citrus meringue tarts have forever been a favourite of mine. In particular home-made citrus meringue tarts, as they are rich and delicious without being too sickly sweet, as patisserie bought tarts often can be. The starting point of these tarts was the beautifully pigmented pomelos spotted at the green grocer this week. Each season, I welcome the arrival of citrus fruits. Seeing thick-skinned oranges, vivacious limes and bright grapefruits all stacked seductively into mounds brings a small amount of seasonal joy and excitement. The arrival of pink pomelos was unusual to say the least. Not native to Australia, it was a complete surprise to see them in mounds, bushels and baskets. So, I purchased the pomelos and used them to re-create my beloved, citrus meringue tarts. Pink Pomelo and Rose Tarts with Honey Meringue are simplistic, decadent and delicious. The tart base is a buttery, light and crumbly pate sucree, or sugar pastry. Inside the pate sucree is a luscious and oozingly dreamy pink pomelo curd that is richly flavoured by the addition of rose water. Topping the curd is a sweet burnt honey meringue that truly unites all the flavours. The pink pomelo and rose curd was originally an experiment. I knew I wanted to harness the unique and slightly bitter taste of the pomelos, as I felt it could offer something more complex than a sub-standard lemon, lime or even orange. I added just a touch of rose water to the curd too, along with a little pomelo zest which added a further floral-y citrus note that the curd was lacking. The resulting curd was utterly delicious – smooth, creamy, slightly sweet and sharp with an interestingly citric flavour. Citrus curd, sweet meringue and buttery pastry are a fated combination. 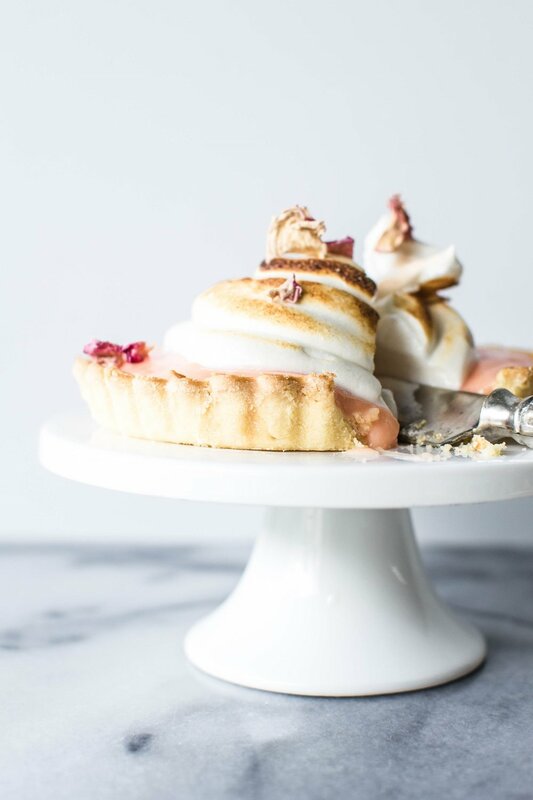 These Pink Pomelo and Rose Tarts with Honey Meringue are utterly delicious and unashamedly feminine - but undoubtedly will be enjoyed by all. As a final flourish, I sprinkled rose petals over the completed tarts, not for any additional flavour of texture, rather just to make their appearance even prettier. They are everything I could ask for and more out of a citrus meringue tart. To make the pink pomelo and rose curd, whisk the sugar and eggs in a medium sized bowl. Slowly add in the pomelo juice followed by the zest and rose water. Place the bowl over a pan of simmering water on medium heat, whisking the mixture continuously. Depending on how pigmented your pomelo’s are – you may need to use a few drops of pink food colouring to deepen up the colour. This can be added here. Cook the curd until it reaches 85 C / 185 F – the curd will be thick enough to coat the back of a spoon and should leave a trail (roughly 20 to 30 minutes). As soon as it reaches temperature, remove the curd from the heat, stir in the softened gelatin sheets and strain it through a sieve. Allow it to cool until it reaches 60 C / 140 F then whisk in the softened butter, a tablespoon at a time. Let the curd return to room temperature before covering closely with cling wrap, and placing in a refrigerator overnight to set. In the bowl of a food processor, combine the flour and icing sugar. Add the butter and process until the mixture resembles coarse meal. With the machine running, add in the egg yolks followed by the ice water. Pulse until the dough holds together without being wet or sticky, being careful not to over-process, which is usually more than 30 seconds. Gently knead the dough on plastic wrap, halve it and then shape it into two flat discs. Wrap and refrigerate for at least an hour before use. When the pastry is ready to be used, butter and flour your tart shells. Roll out the discs to .4 cm / 1/8 inch thick. Line your tart shells with the pastry, trim the excess and refrigerate for an hour. Pre-heat the oven to 200 C /400 C. Using weights, blind-bake the tart shells for 7 to 10 minutes or until golden. Remove the weights from the tarts, pierce the bases with a fork and lightly glaze with egg wash before returning to the oven and allowing to crisp and brown for a further 5 minutes. Remove from the oven and let cool completely. Set the curd out of the refrigerator to soften slightly before piping it into the cooled tartlet bases. Pipe the honey meringue (recipe follows) into a ‘beehive’ peaked shape, singe with a blow torch and sprinkle with a few rose petals. The tarts can then be served or set in the refrigerator to slightly harden both curd and meringue. For the honey meringue, place the egg whites in the bowl of a stand mixer fitted with a whisk attachment. Whisk the whites on medium speed to form medium peaks. Meanwhile, heat the honey in a small saucepan set over a low heat until it reaches a temperature of 120 C / 250 F. Once at temperature, slowly add the honey in a steady stream to the egg whites. Increase the speed to high and whisk until the bowl is cool to the touch and the whites hold stiff, glossy peaks.